Time: 3 hrs. 45 mins. Lower Cathedral Wash is located in the Glen Canyon National Recreation Area near Lees Ferry, Arizona. 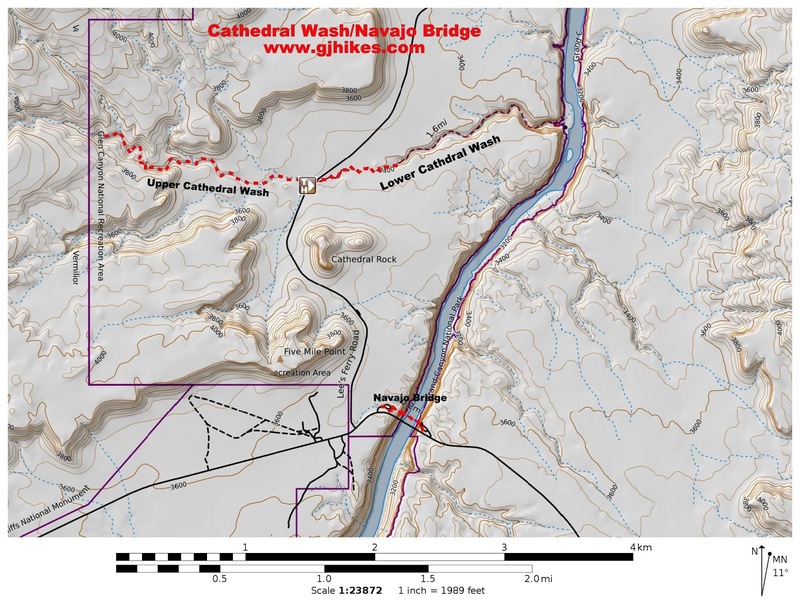 The trail begins where the Lees Ferry Road crosses Cathedral Wash. From there it follows the shallow canyon downstream to the Colorado River. The lower part of the trail near the Colorado River is within the boundaries of the Grand Canyon National Park. Due to the dangers of flash flooding the wash should be avoided when thunderstorms are present in the area. To get to the trailhead follow the directions for Navajo Bridge. Just past the Navajo Bridge Interpretive Center turn right onto Lees Ferry Road. After a short distance the Lees Ferry Road will come to a self pay station where you can surrender the requisite fee. A short distance past that the road bends around Cathedral Rock. 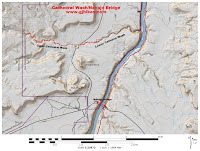 There is a pullout on the north side of the road for Cathedral Wash.
From the parking area follow the trail down into the wash and through the concrete culvert. After passing under the highway the trail continues down the shallow rock strewn wash.
With each bend in the wash the route becomes more interesting. As the wash deepens it cuts into a layer of limestone. The base of the wash becomes narrower as the limestone is harder for the water to carve out than the softer layers of rock above it. A few spillovers that require some scrambling are encountered as things progress. The water in this particular one was just over knee deep. The narrow confines of the canyon make for a beautiful hike. Some of the spillovers can be easily hiked around. We came upon our Waterloo near the halfway point where we couldn't reach the bottom of one of the puddles. There had been daily thunderstorms over the last week with very little chance for anything to dry out so this is as far as we went. Even after doing less than half of the Lower Cathedral Wash trail we could tell it was a place worth returning to. Since a little information is better than none we will go ahead and post what we have. Sometimes for us just finding the trailhead can be the hardest part of a hike. I'm not sure what is in the water here but it took a couple of weeks to get the foul smell out of my boots. If you would like to see it for yourself then all you have to do is 'Take a hike'.